Menu Plan Monday, December 16th! What a busy week! This week seems like it will be equally busy with several parties and the ending of school for the year 2013! Then it’s vacation and Christmas and I am excited about that! 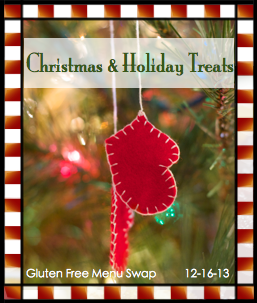 The theme for the Gluten Free Menu Swap over at Celiac Family is Christmas Favorites. Growing up we would always have another big meal like Thanksgiving on Christmas Day, but now that I’m responsible for it myself we tend to do something simpler on Christmas Day. If I could eat it I might even be one of those who order pizza–just so everyone could have time to play/read including me! However, I am planning on some simple and quick cinnamon buns for breakfast and my favorite grilled shrimp for Christmas dinner. I will also attempt to make my own egg nog like last year as the soy filled kind bothers me. First I have to find the recipe I used! Since I forgot to take a picture of food this week, here’s a picture of my manger scene! More easy recipes for this week! I have a brunch, a luncheon, a date out, and a cookie bake coming up this week so simple foods are a must or I would probably give up on cooking all together. I will be baking some Pumpkin Molasses Cookie Dough Balls (subbing a gluten-free flour mix for the regular flour!) for the cookie exchange and I will also be finishing up (including these treats for the dogs I know: Peanut butter and Pumpkin Puppy Treats) and delivering Christmas presents to coworkers and friends! Lunch: Dinner with the family: Chicken and stuffing casserole (leftover salmon for me!) with mashed potatoes, cranberry sauce, olives, broccoli, and corn. This gingerbread subbing pumpkin instead of zucchini! Sloppy Joes with Lentil sloppy joes for me! My husband’s clean out the fridge veggie soup–maybe I’ll be able to write down the recipe for you all! I much prefer simple Christmas dinners. I think I started making lasagna after awhile. I seem to remember that. Lasagna just gets super complicated when you have to make the nondairy cheese. I’ve been thinking about it, but it’s taking a long time to work up to that. Yes, but that was long ago. You do seem busy. Goodness. I love the Christmas decorations and the hanging wine glasses. Very nice. I agree. Thankfully, this is the busiest week of the year. Other times I am more successful in avoiding so many events. Thank you! 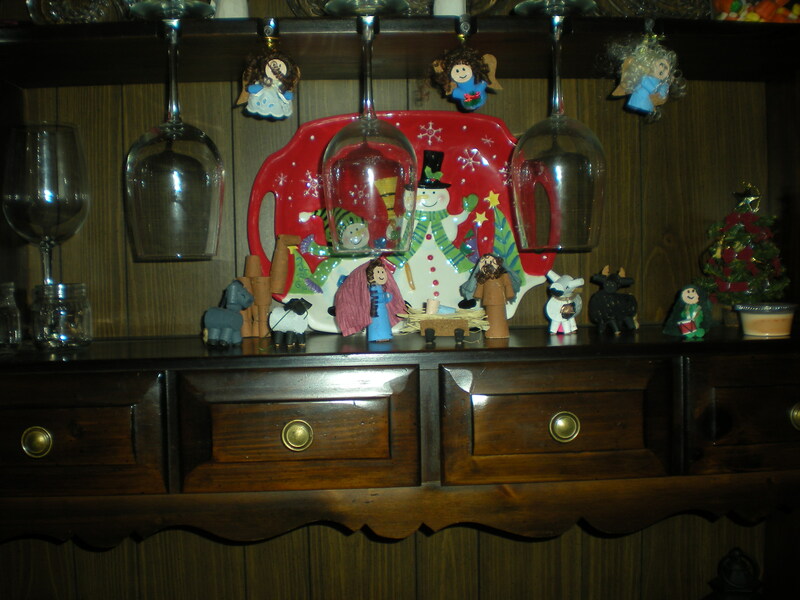 I made the decorations myself–out of corks–a long time ago! You did? Marvelous! I tried my hand at making decorations once. Isn’t to be repeated. Your Christmas decorations are very pretty! My princess was given a little people nativity for Christmas a couple of years ago but she and my little man keep misplacing the pieces. Currently a sheep, the baby Jesus, and one wise man are the only pieces set in the manger of the nativity.